Two hundred risk and insurance leaders congregated in Luxembourg to celebrate excellence and innovation in Europe’s captive market. 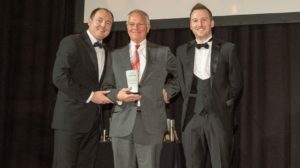 Service providers, captive owners and individuals were recognised across 28 categories in a night that saw Guenter Droese take home the Outstanding Contribution by an Individual award. The full list of winners and judges’ comments are available below. Judges comments: The judges were particularly impressed by Generali’s healthcare reporting and dashboards that are designed more transparency and data points to insureds and captive owners. Substantial client testimonials clearly demonstrated the value of these tools and how they help improve the efficiency and performance of captive programmes. Judges comments: Willis Towers Watson has been instrumental among a group of service providers who have contributed to an industry-wide response to the OECD’s Beps project. Its RADAR tool has been well received by clients as the captive manager helps captive owners meet compliance and evaluate their future strategy in a Beps environment. Judges comments: BDO’s significant Guernsey operation and market share impressed the judges and the firm demonstrated a strong commitment to the insurance industry – particularly traditional captive business and insurance-linked securities (ILS) structures. BDO also demonstrated a high degree of flexibility, most notably in its accounting work with innovative protected cell companies on island. Judges comments: AXA scored particularly high for its commitment to the captive industry and its expertise and experience across the carrier. The carrier has worked hard to integrate its multiple captive services into one offering, which the judges recognised would only be enhanced by its acquisition of XL Catlin. The high calibre of client testimonials were also highlighted, demonstrating strong customer satisfaction and the reach of its experts. Judges comments: Aon has continued to evolve its Solvency II platform, from implementation to the cycle of compliance with the directive. The collaboration of its actuarial, risk financing and captive management units has produced several tools seen as valuable to clients as they get to grips with new requirements, particularly concerning reporting. Judges comments: Marsh’s entry into the EU’s PCC market is a welcome addition for the captive sector and the initiative has produced strong client feedback in the first year of operation. Middle market insureds have already begun making good use of the Malta-domiciled vehicle and the judges were impressed by the client testimonials provided. Judges comments: Zurich’s fronting innovation impressed the judges, scoring particularly highly for its proof of value creation and captive expertise and experience. Its introduction of life/non-life cross class aggregate stop loss for captives was highlighted as is expected to become increasingly relevant in the European market as captives become more sophisticated and more add employee benefits to their portfolios. Judges comments: Gerjan Delhaas has proved himself a valuable member of the Dutch captive owners group, and his career progression from AkzoNobel to Unilever as corporate insurance manager also demonstrated his captive expertise in his day job. His research paper on supply chain risk for his MBA qualification further emphasised his dedication to risk and insurance management and he is well established as a thought leader for today and in the future. Judges comments: Guernsey continues to lead the way for captive formations in Europe and its non-Solvency II regime is a key differentiator. The local infrastructure and regulatory understanding of the captive concept are quite unique in the region and provides insureds with a strong captive home in an increasingly difficult environment. Judges comments: EY’s multi-faceted tax team has proved itself as a valuable resource for Europe’s captive insurance market, from tax compliance to Beps reviews and guidance. The firm has also been at the forefront of efforts to help European captive clients understands the impacts of President Trump’s tax reform in the United States. Judges comments: Willis Towers Watson has proved itself a highly capable and innovative partner on the implementation and ongoing management of employee benefits programmes for captives. The judges were impressed with the firm’s ability to stay at the forefront of an increasingly important, fast growing and competitive area of Europe’s captive market. The judges were impressed with WTW’s dedication to innovation and the high calibre of its client testimonials. Judges comments: R&Q’s track record in captive acquisitions and legacy management has provided it with unrivalled expertise and a solid contact base across the industry’s legal, captive management and regulator communities. The judges were impressed with its portfolio of consolidator vehicles in major on- and offshore captive jurisdictions around the world, demonstrating an ability to provide solutions to a diverse base of clients. Judges comments: Hassans and partner Nigel Feetham have been at the forefront of the European legal community in outlining potential solutions and accommodation for restructuring of captive insurers in preparation for Brexit. Feetham has been pro-active in his bid to build a constructive and symbiotic relationship with the Malta community as direct writers look to keep their access to the EU and/or UK markets. Hassans has also worked closely with gaming company Lottoland on the formation of its PCC and sponsorship of an innovative collateralised reinsurance product to finance its jackpot coverage. Judges comments: AXA’s use of its parametrics unit in relation to captives impressed the judges and clearly demonstrated an innovative new toolkit for insureds to access as they become more sophisticated and confident in their identification and quantification of risk. Parametric insurance products are expected to become more popular with captive insurers and AXA is well placed to serve growing demand. Judges comments: AIG’s client testimonials clearly demonstrated the carrier’s expert delivery of global insurance programmes and, particularly, its Multinational End to End process initiative. The new framework incorporates programme design, contract certainty and compliance is designed to help clients thrive in an increasingly difficult regulatory environment. Judges comments: Allianz outlined a clear application of its understanding of underwriting and liability profiles when working with captives in a Solvency II environment. The judges recognised Allianz’s approach to increase efficient management of capital and expect it to leverage the carrier’s extensive relationship with insured’s to roll out its solution further. Judges comments: The depth of Willis Towers Watson’s actuarial capabilities was highlighted by the judges and its investment in technology to improve analysis utilising industry data was also recognised. Its actuarial loss forecast models are available across multiple established and emerging line of insurance while its client testimonials were substantial and impressive. Judges comments: Carl Leeman is an experienced risk manager with a strong commitment to captives. His near 30-year experience at Katoen Natie has given him in-depth understanding of the captive business model and provided FERMA and the wider captive industry with invaluable insight and expertise as it lobbies the OECD for greater understanding of captives. Leeman has been extremely generous with his time and expertise in contributing to the market response, and was instrumental in the production of the Federation’s position paper on captives and the comments it produced this year concerning transfer pricing. Judges comments: Aon’s Brexit Navigator proposition impressed the judges as a bespoke tool provided to clients to assess how the UK’s exit from the EU would impact its business operations, risk profile and captive structure. The judges recognised the strong client demand for such a product in an uncertain environment and the fact it helped organisations clearly map out where it might be impacted by Brexit. Judges comments: Wilmington Trust outlined a clear proposition for collateral trust services in the European market for both traditional captive and insurance-linked securities structures. The judges recognised the strong team that has been built at Wilmington over the past two years and deep subject matter expertise concerning the captive market. Judges comments: The innovation on show in the blockchain Insurwave project, now live in the market after a successful pilot, impressed the judges. AXA XL and EY played key roles in the design and implementation of the platform alongside other participants and the ultimate client and partner, shipping giant Moller–Maersk. Blockchain utilisation by the (re)insurance market is a hot topic and the judges recognised the successful practical work completed by the winners. Judges comments: The fronting capabilities of AXA XL are clear from the substantial increase in fronting business it has attracted over the past 12 months and the strong client testimonials provided. Its growing dedicated captive team is making a significant impact in the European captive market and its Global Program Centre of Excellence was also highlighted by the judges as a useful tool for fronting programmes. Judges comments: The judges appreciated the independent approach of Allenby and its experience working with some of the largest multinationals in the world on their captive insurance programmes. Its ability to re-assess and optimise insurance programmes through innovation with the captive was well evidenced through client testimonials. Judges comments: Luxembourg’s local (re)insurance substance and infrastructure in on the up with Brexit on the horizon and a number of larger multinational (re)insurers moving in. The judges also recognised the high number of captive leaders, on both the client and service provider side, who are located in the jurisdiction. The regulator has got to grips well with Solvency II and is willing to engage in dialogue regarding proportionality for captives. Judges comments: Angela Iannetta has continued to innovative and push an aggressive captive agenda at British American Tobacco, transforming its insurance strategy and ensuring its unlocks as much value from its insurance subsidiary as possible. The captive is now front and centre of its risk management programme, providing significant economic benefits to the parent. Judges comments: Marsh’s global captive platform impressed the judges, as well as its high calibre of talent across the European market in both the leading captive jurisdictions and in client facing consulting roles. Its leverage of the wider MMC group of companies such as Mercer, Oliver Wyman and Guy Carpenter was deemed a valuable resource and the judges were impressed by a series of high quality testimonials from some of the most sophisticated captive owners on the continent. Judges comments: Guenter Droese is a man that needs little introduction in the European captive market. Formerly of Deutsche Bank and a founder of ECIROA, Droese’s expertise and commitment to the captive sector is without question or challenger over the past 10 years. The European Captive Forum would not be the world leading event it is today without his passion for captive insurance and strong belief in the power of gathering the brightest minds in the industry together. When the history of Europe’s captive industry is written, Droese will be among the central protagonists for an extremely sophisticated market.